It doesn’t have to be hard to find dealerships that specialize in new trucks for sale near me. All you need is Ewald Chrysler Jeep Dodge Ram of Oconomowoc WI. We take the difficulty out of finding new trucks for sale in Wisconsin. We also have older used Dodge Ram trucks for sale at our Dodge Ram dealership near you. Ewald’s Chrysler Jeep Dodge Ram dealership near you has what you want when it comes to new trucks for sale in Wisconsin. Ewald Chrysler Jeep Dodge Ram dealerships in Wisconsin also offers a great selection of Ram diesel trucks for sale. So drivers from all around can find and try out all types of new Ram trucks for sale near you. Ewald’s Dodge Ram truck dealership is sure to be any Ram truck shoppers ideal spot. That is because we offer great deals on new Ram trucks for sale. Ewald’s Dodge Ram truck dealership near you desires to find you the perfect truck for your needs and wants. 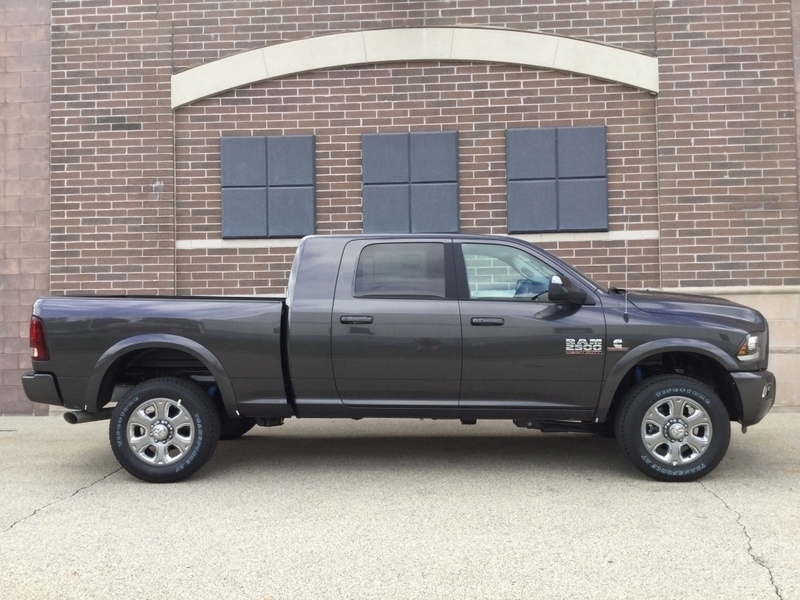 Whether it is for work or for pleasure, we have the Ram truck for sale at our car dealerships in Wisconsin. Our sales team at Ewald Chrysler Jeep Dodge Ram is ready to answer any questions you have about our new Ram trucks for sale and new diesel trucks for sale. As well as take you out on a test drive to make sure the Ram truck for sale that you take out is the right truck for you. Diesel trucks for sale have been a Ram truck model that has inspired and assisted drivers from all around Wisconsin for many years. Diesel truck owners have trusted and relied on the Ram name for generations. And our new Ram diesel trucks for sale are sure to please. Like the new 2018 Ram 2500 Laramie diesel truck for sale. This new Ram diesel truck for sale can offer you extraordinary power and capability. With this new diesel truck for sale, you can take advantage of a powerful 6 cylinder, 6.7-liter diesel engine. This new diesel truck for sale is also equipped with features such as a rear parking aid, steering wheel audio controls, and even more. There is even more to enjoy with this or one of our other new diesel trucks for sale. So come on over to your Ewald’s Dodge Ram dealership near you and try one of our new diesel trucks for sale out today! Whether you choose one of our new diesel trucks for sale or one of our other new Ram trucks for sale, we have the right Ram truck waiting for you at Ewald Chrysler Jeep Dodge Ram of Oconomowoc. Stop on by Ewald Chrysler Jeep Dodge Ram today located at 36833 E Wisconsin Ave Oconomowoc, WI 53066 for your next Ram truck today. If you have any questions about the new Ram trucks for sale that you've seen listed online at our Dodge Ram dealership, please don't hesitate to give us a call.